Twinned with Compiegne in France and Kevelaer in Germany, Bury St Edmunds is home to award-winning restaurants and prestige shopping. Most famous for its Abbey Gardens, Bury is also home to the Nutshell, formerly Britain’s smallest pub; the Theatre Royal, a restored Regency theatre; a beautiful cathedral; and the remains of the Abbey itself. Shopping is provided by high street names in the Arc shopping centre, as well as independent stores in the town itself. Average house prices in Bury St Edmunds – March 2019 according to Zoopla. Located just 2 hours from London, Bury is easily accessible by the A14 and the M11. Cambridge is just 35 minutes away, with Newmarket and Ely also within easy reach. Bury St Edmunds train station provides good transport links to Cambridge, Peterborough, Ipswich and both London Liverpool Street and Kings Cross, making it an excellent base from which to commute into the capital. 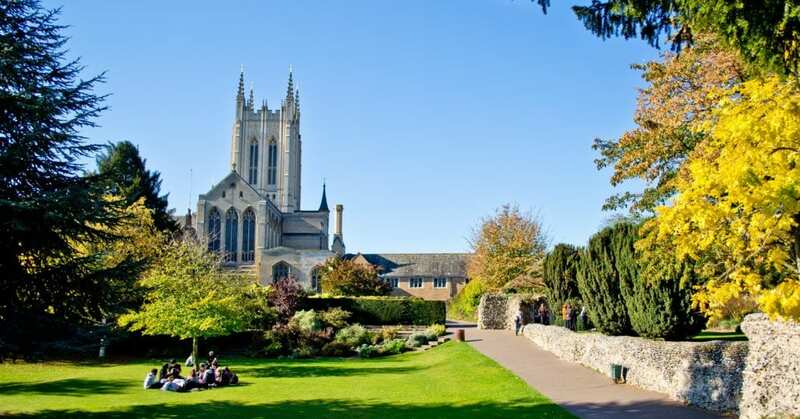 The town of Bury St Edmunds boasts 25 primary and secondary schools within a 3-mile radius, including the highly rated Bury St Edmunds County Upper School and the Priory School. West Suffolk College provides an impressive range of courses, including more than 40 foundation and honours degrees in partnership with the University of Suffolk. A number of high street shops can be found in the arc shopping centre, while its medieval streets are lined with independent outlets. Described by The Guardian as ‘a charming culinary hotspot’, Bury is home to some great restaurants, including Pea Porridge, Maison Bleue and The Angel. For a night out, The Apex offers a varied programme of live music, dance and performing arts alongside its renowned modern art gallery. There are also plenty of bars, including LP, The Snug Bar, the One Bull and the Nutshell, former holder of the title ‘smallest pub in Britain’. There are also two cinemas, including the Abbeygate Cinema, a charming and unique cinema which offers a tasteful and refined theatre-like experience. Why live in Bury St Edmunds? Bury St Edmunds is a wonderful historic town with something for everyone. An important market town, Bury’s properties represent architecture from throughout the ages. With some wonderful independent shops and restaurants alongside well-known brands, the town has everything you need and more. Bury St Edmunds is named after St Edmund, King of the East Angles, and the first Patron Saint of England. Although it is believed King Edmunds is buried in the town, in this case, ‘Bury’ means borough and derives from the German word burg, meaning fortress or castle. Bury St Edmunds was mentioned in Charles Dickens’s novel The Pickwick Papers as ‘a handsome little town, of thriving and cleanly appearance’. 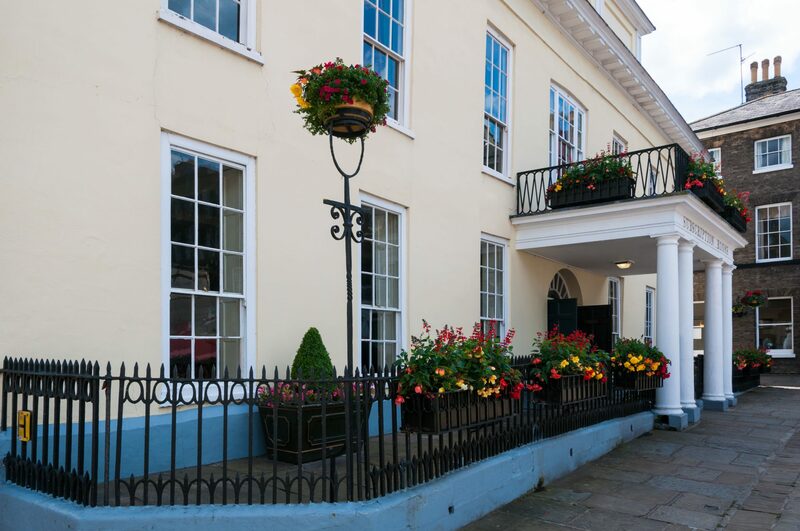 Dickens himself stayed in the Angel Hotel and you can still sleep in the same bed he did. Bury is home to Britain’s first ever internally illuminated street sign – the Pillar of Salt. It stands at the terminus of the A1101, itself Britain’s lowest road. Bury’s sugar beet factory is the UK’s largest milled sugar plant. 250,000 tonnes of sugar are produced annually. Do you want to move to Bury St Edmunds? If you’re looking to move to Bury St Edmunds or the surrounding areas, visit our Bury office and speak to our friendly team. Alternatively, call them on 01284 725525 or email bury@davidburr.co.uk. All our latest listings can be found on our properties for sale page.